end up looking like a pile of ingredients all mixed togerher. Maybe it’s a skill I should try and work on, but to be honest I’ve never been a big breakfast eater. I go through phases where I can’t walk out the door unless I have a big bowl of cereal, a smoothie, or a bagel. At the moment I get by on coffee for breakfast… by the time 11 am rolls by I am absolutely ravenous– a ticking time bomb. Now, there are some occasions when whipping up a large breakfast is an absolute must. Maybe you’re having company for the weekend or maybe you’re just feeling an extra breakfast-y sort of morning. 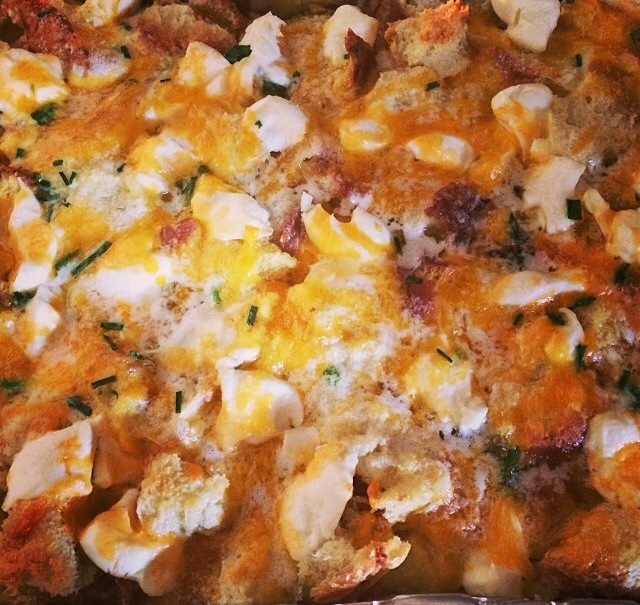 The perfect solution is a breakfast casserole. I know what you’re thinking. Casseroles seems so Brady Bunch and passé don’t they? I think it’s just the name– CASSEROLE. Sounds gross…I bet you if someone changed the name they would become en vogue again. Anyway, this dish is disturbingly easy to make. Seriously anyone can do it. The best part is it can be made up to 24 hours in advance, allowing you to get plenty of stress-free beauty rest. Guests will literally think you slaved all morning in the kitchen, especially with the unexpected flavor from the onion rolls and chives. You can sashay into the kitchen one hour before guests arrive, and while it cooks work on more important things…like making Bloody Mary’s and mimosas. Cut butter and place pats all over top of dish. Mix remaining ingredients and pour over top. Cover with foil and refrigerate overnight. Bake at 325 for 45 minutes. Remove foil, increase temp to 350 and bake an additional 10 minutes. Serve!